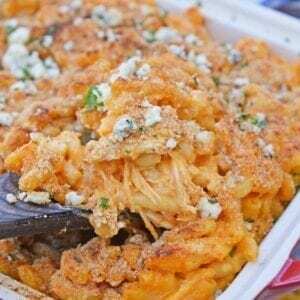 Buffalo Chicken Mac and Cheese Recipe - Best Baked Mac and Cheese! There is nothing quite as wholesome and soul warming as a fresh dish of baked macaroni and cheese. Straight out of the oven, I’m inclined to reach in a pick off the crunchy little edges. 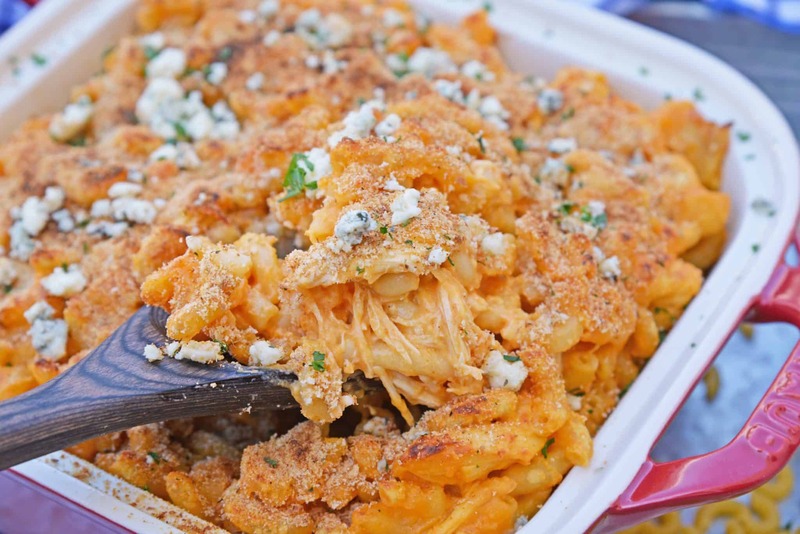 The only thing that makes it better is when it is Buffalo Chicken Mac and Cheese! 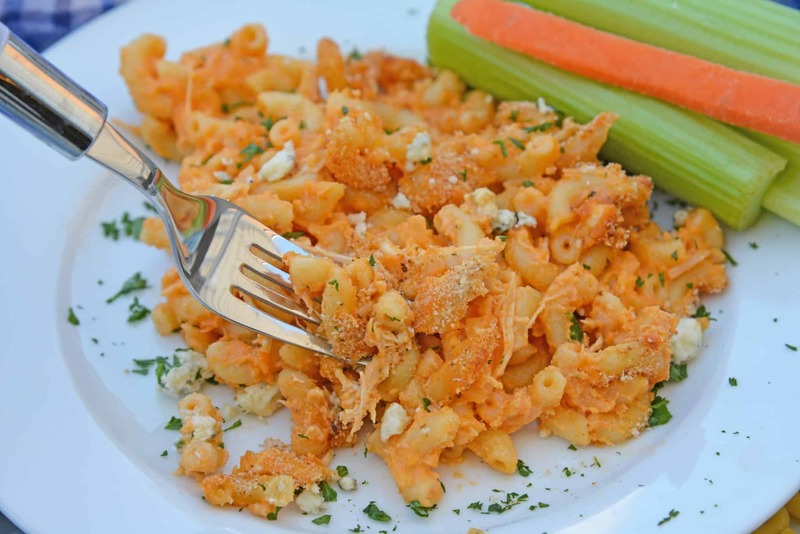 Buffalo Chicken Mac and Cheese is a quick and spicy baked mac and cheese recipe the whole family will love. 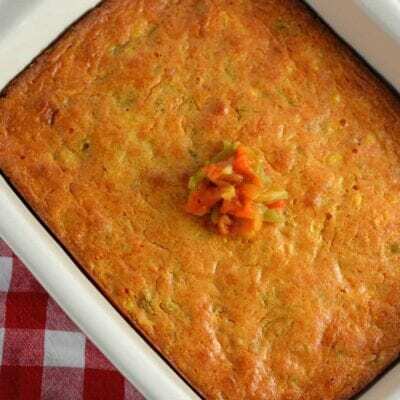 Perfect as a potluck recipe or for a BBQ side dish! I’ll tell you all about this buffalo chicken mac and cheese, but before I do, can we talk a little about my new favorite cookware website? 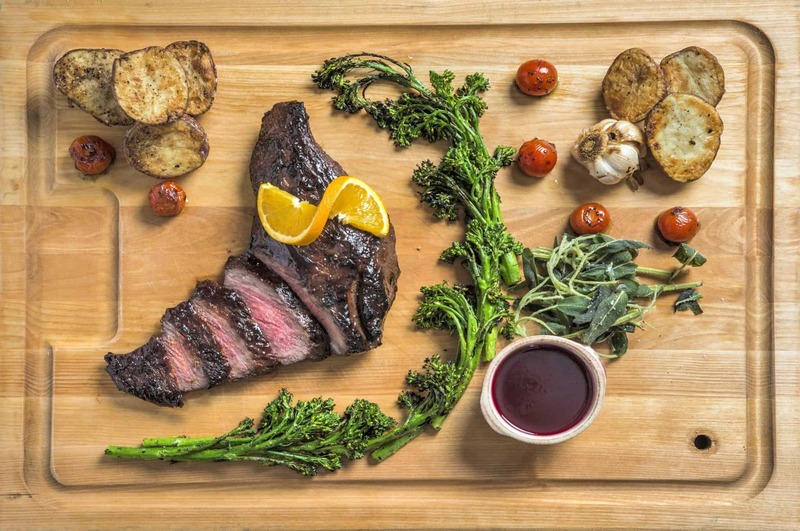 Beautiful tools make tasty food that much better and the process of cooking that much more fun. 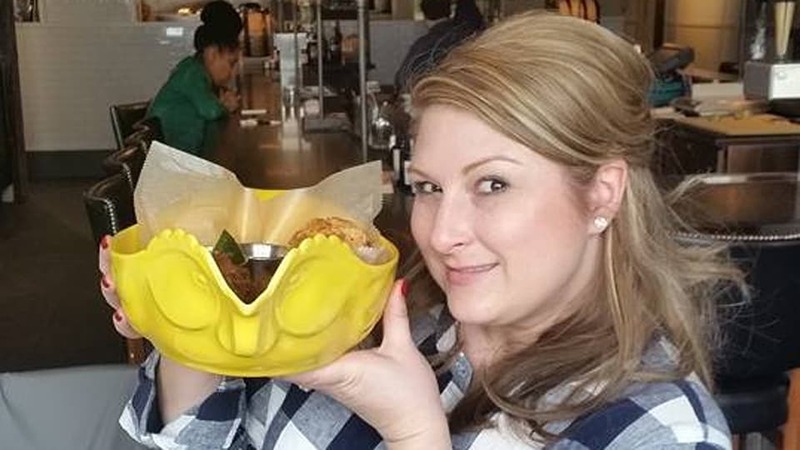 At Southern Kitchen they sell gorgeous vessels that are practical and pretty. The best of both worlds. 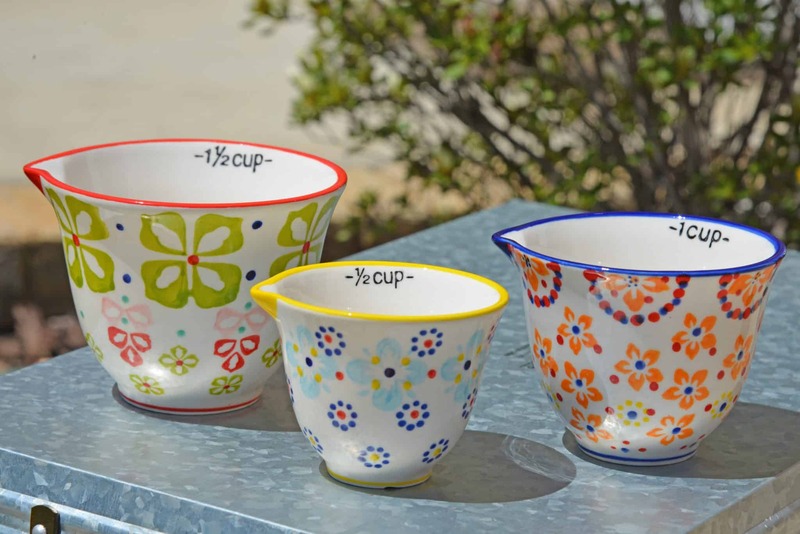 Check out these hand painted stoneware measuring cups. I actually leave them on my countertop as accent pieces. Spouts make them handy for liquid and dry measuring. 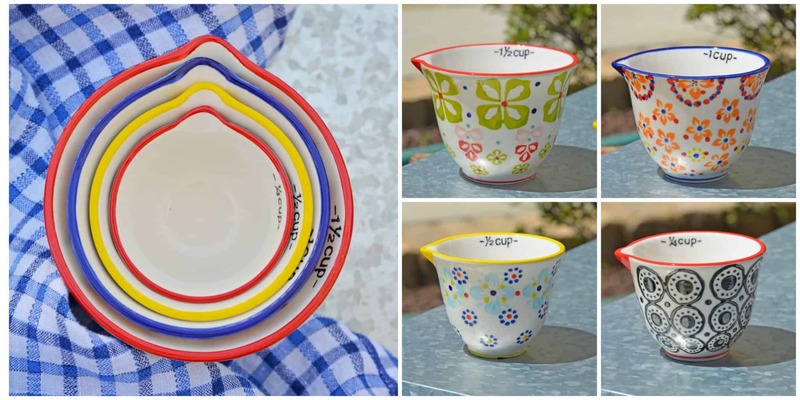 Colorful designs guarantee to put a smile on your face while in use. For a while now I’ve been obsessed with this chicken roaster. I visit it on the regular at Bryan Voltaggio’s Family Table and now I can have one of my very own! 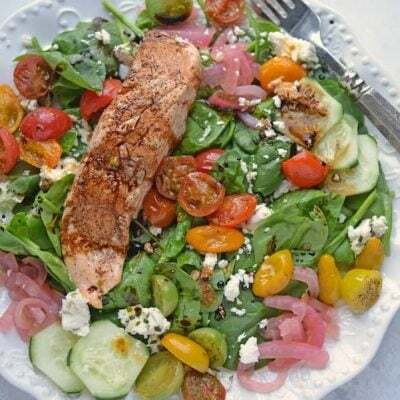 Southern Kitchen offers more than just stylish kitchenware, they also host a weekly Sunday Supper Podcast that you can also catch on Facebook Live Friday afternoons. Topics are informational with Southern pizazz like The Biscuit Commandments and The Women of Cast Iron Chronicles. 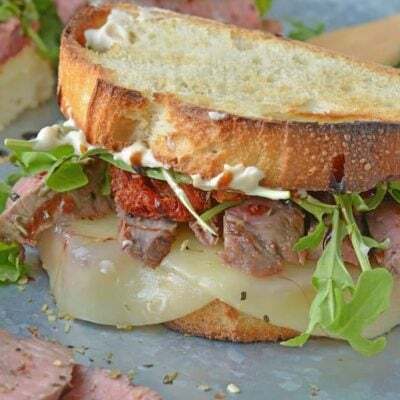 Virginia Willis is a regular collaborator, offering classic recipes like good ole Southern Egg Sandwiches. They even allow YOU to be a part of the kitchen fun by submitting your own family recipes! 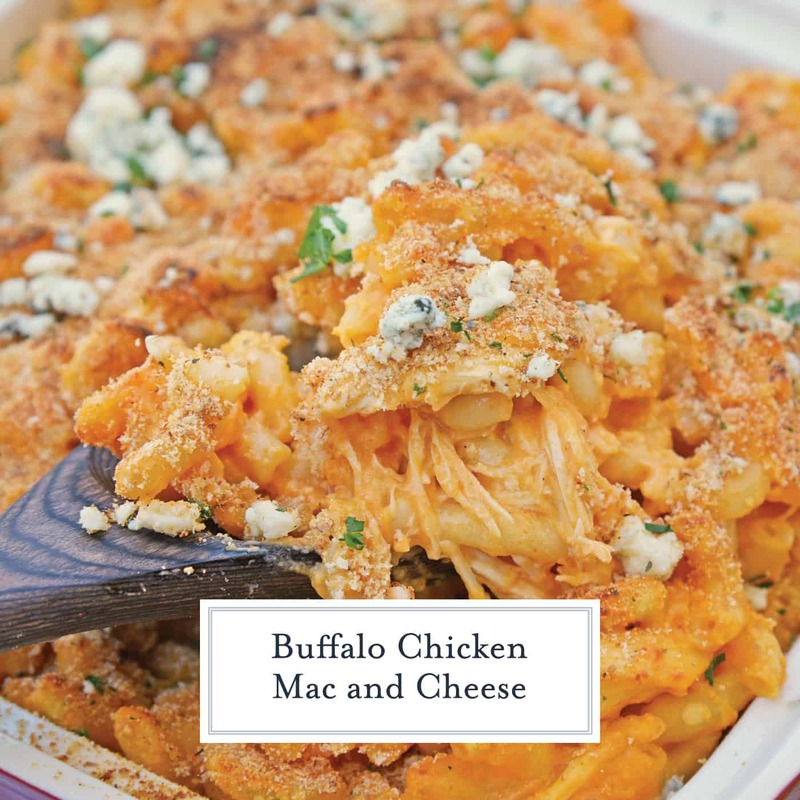 Before you get cooking, here are few notes about this fabulous Buffalo Chicken Mac and Cheese Recipe. Prepare to be WOWED. Then prepare to be slightly obsessed. 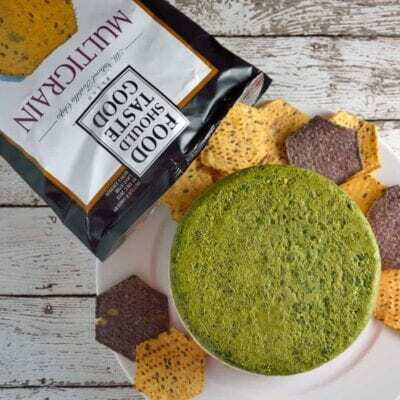 My family loves this stuff and it is requested at every party I attend. Click the link for my classic buffalo sauce, but feel free to use a mild version, your favorite flavor or even get crazy and use a BBQ sauce! 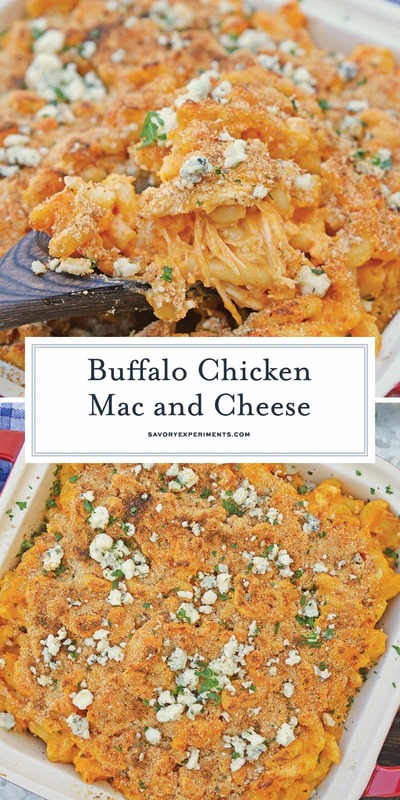 Many Buffalo Chicken Mac and Cheese Recipes use sour cream for the creaminess factor, but I prefer mayonnaise. 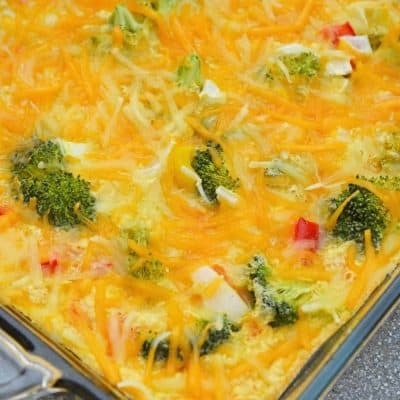 Mayo not only adds creaminess, but since it is made from eggs, helps hold the mac and cheese casserole together. This mac and cheese sauce is thick, creamy and will grasp onto the ingredients. 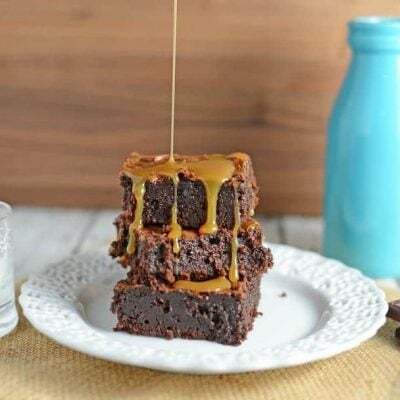 If you prefer a thinner sauce, add an additional ½ cup of milk. 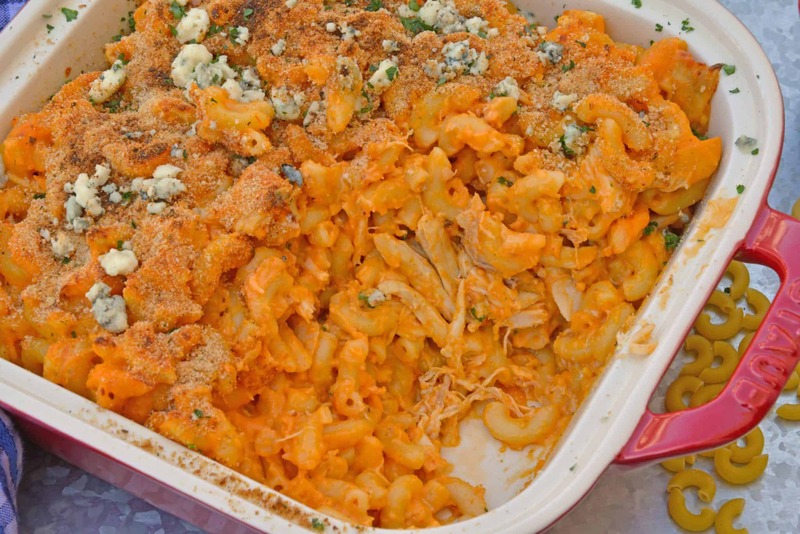 Scroll down to the notes section to see more fun variations on this spicy buffalo chicken pasta bake! Cook elbow pasta according to package directions for “al dente”. Drain and set aside. In the same large pot, melt butter over medium-low heat. Add dried minced onion, kosher salt and white pepper. Stir until butter is melted and onion is fragrant. Whisk in flour until a paste forms. Slowly add milk to form a thick cream, then add a little more until all milk is added and there are no flour lumps. Add buffalo sauce, whisking until combined. Add shredded cheddar cheese and mayonnaise, whisking until combined. Fold in cooked elbow macaroni and shredded chicken. Coat a 9x9 baking dish with cooking spray. Transfer contents to baking dish and top with seasoned bread crumbs. Bake, uncovered, for 20 minutes. Change to low broil to brown the bread crumbs. 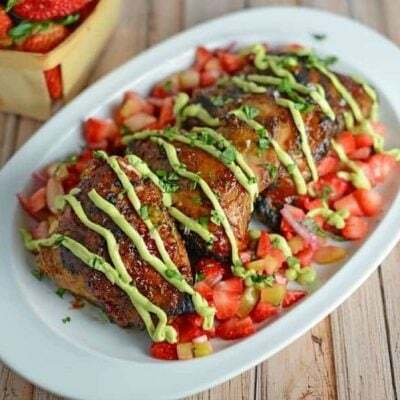 Remove, top with blue cheese crumbles and parsley, if desired. 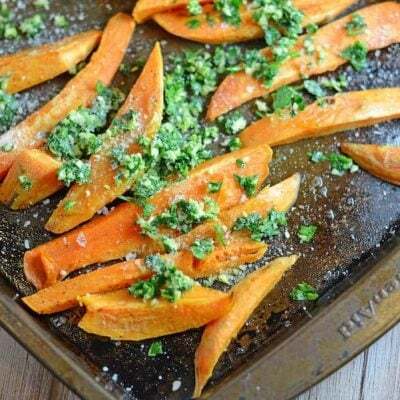 Serve hot with celery and carrot sticks. I love anything buffalo flavor. 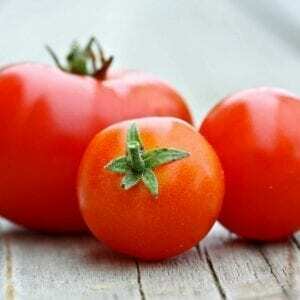 I love your idea to use it with pasta!! Thank you! We are buffalo lovers too! Staub is one of my absolute favourite and specially wehn you have got some great mac and cheese, its time to dig in for more. 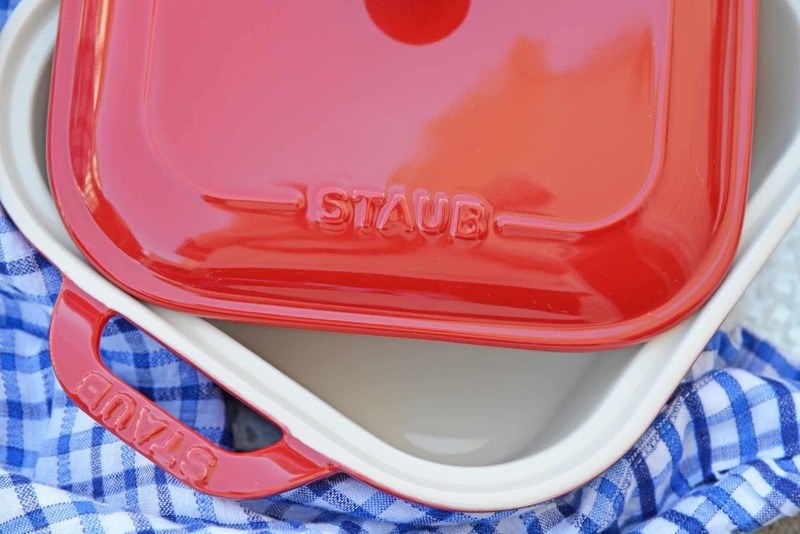 Make sure you click over and get a discount for STAUB! This sounds wonderful. My daughters are going to love this. They like buffalo chicken and Mac n cheese. The combination is super!! Oh I adore those measuring cups! And I’m a big fan of Staub here … this kitchen shop might be dangerous for my credit card, ha ha 😉 Lovely recipe too. 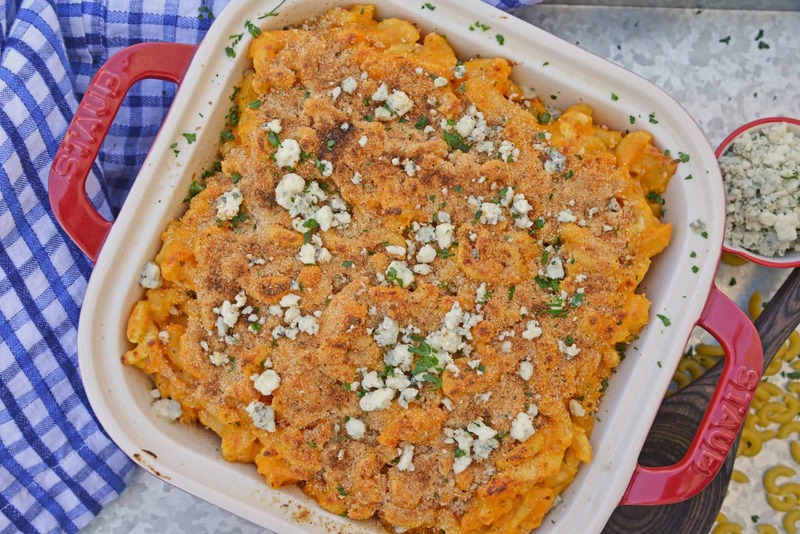 I love mac and cheese and this sounds like such a delicious spin! Aren’t thy adorable??? I love them! 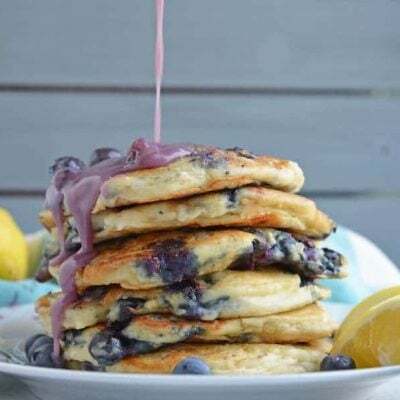 I am literally drooling right now! As a huge fan of anything buffalo chicken this recipe is right up my alley! Definitely pinning this to make very soon!!! Great job!